Calsonic Kansei Corp exhibits a front-end module and an instrument panel. The front-end module is composed of headlamps, a radiator, etc mounted on the carrier made of CFRP (carbon fiber reinforced plastic). "Skyline" uses a CFRP carrier, but the one for GT-R is bigger-sized and higher in rigidity. According to a body designer of Nissan Motor Co Ltd, the rigidity of the carrier has a big influence on the regulation of vertical movement and torsion of front side members. The corners where the vertical parts cross the horizontal parts are especially reinforced. The carrier is installed on the body by bolts. n general subframes, a pipe on each side is bent to form a hanging rack-like structure, connecting the two. However, the upper arm and the lower arm have independent pipes on both right and left sides in this subframe. By supporting each arm with each pipe, the lateral rigidity of the suspension is improved. 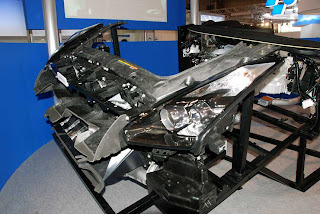 The subframe itself is larger and heavier because it adopted a transaxle system. It is 25-29kg, while normal subframe is 20-24kg. You thought about setting up a forum?